Most liqueur books have a detailed process listed for straining and filtering your infusion. They usually include a mesh strainer, then multiple layers of cheesecloth, and finally paper coffee filters. Most of this works great. And depending on what you are filtering, that process can be all that is needed. 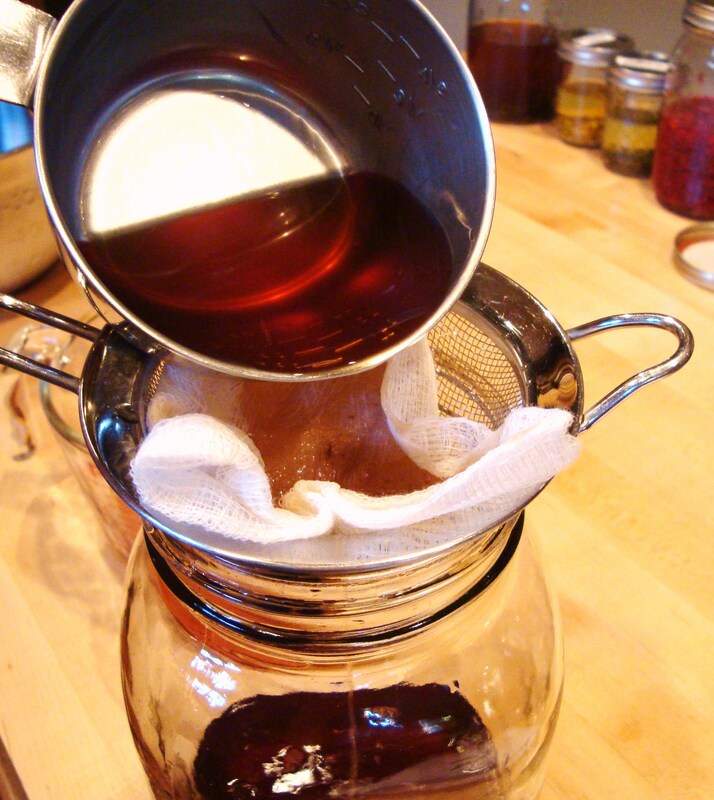 I add an additional step in this process, filtration through a jelly-bag or jelly-straining set. Believe it or not, this extra step can save a lot of time and effort. Depending on how much material is left in the liquid after the initial straining, I sometimes skip the cheesecloth step. I rarely skip the jelly-bag. 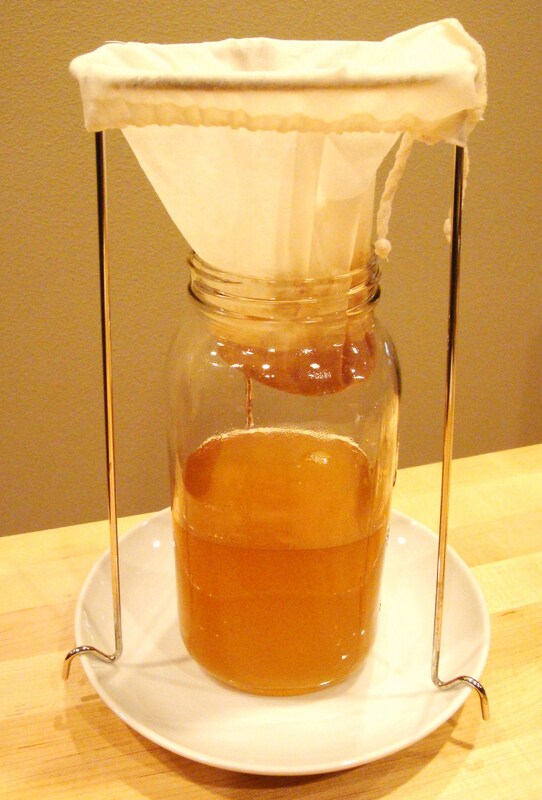 It filters much finer than cheesecloth, without having to run it through multiple times. Depending on what you are straining, you may need a small or large strainer. For this liqueur, I used a very small strainer, and poured directly through a wide-mouth funnel into a canning jar. For other items, I will often use a much larger strainer over a mixing bowl. You may want to start with just a few layers of cheesecloth, and then filter a few more times, increasing the layers each time. For ingredients with very fine particles, you may only filter once or skip this step. For the ginger-lime gin, I skipped from the mesh strainer directly to the jelly bag (step 3). 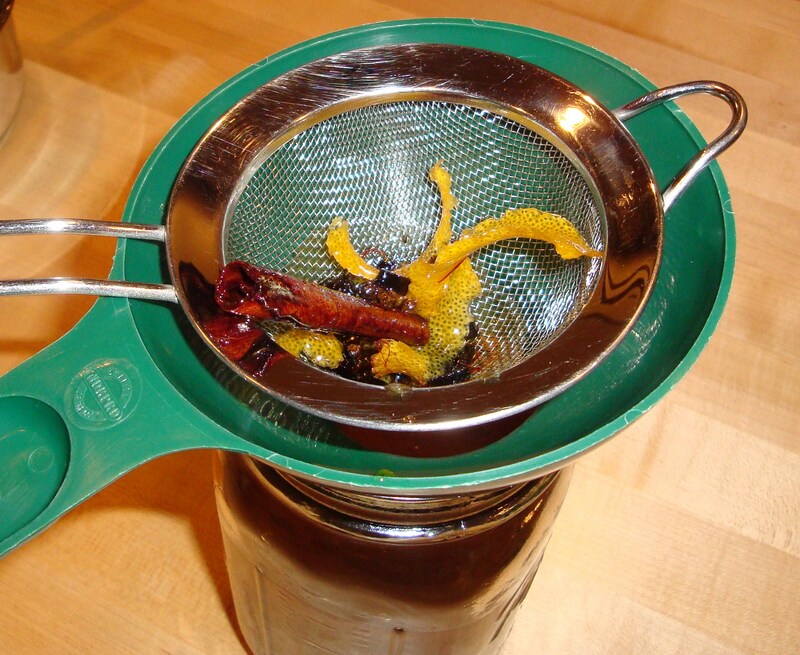 For those of you who are home-canners, you likely already have a jelly bag or jelly strainer of some sort. If not, you can find one on Amazon, or at a local shop. For those of you in Portland, OR, Mirador in SE Portland almost always has them in stock. And in the summer months, you can find them at Bi-Mart. The jelly straining kit is usually used over a bowl, but I find it much less messy to use it over a jar, as demonstrated above. This set fits perfectly on the rim of my salad plate, but works fine if you just set it on the counter as well. Feel free to run the liqueur through the jelly strainer a few times. Most liqueurs strain very well with just one pass through the jelly bag, but with fine particles of spices, a second or third pass can be helpful. The paper coffee filter will really help get a well-refined product, but is usually the longest step in the process. If you are consuming this yourself or in the comforts of your home, you may not be as concerned about good filtration. For example, I didn’t bother filtering the Raspberry Cachaça or Cherry Bourbon at all. For the Pineapple, I didn’t bother going past the cheesecloth stage. But for most of my liqueurs, especially those I’m giving as gifts, the coffee filter is an essential step. 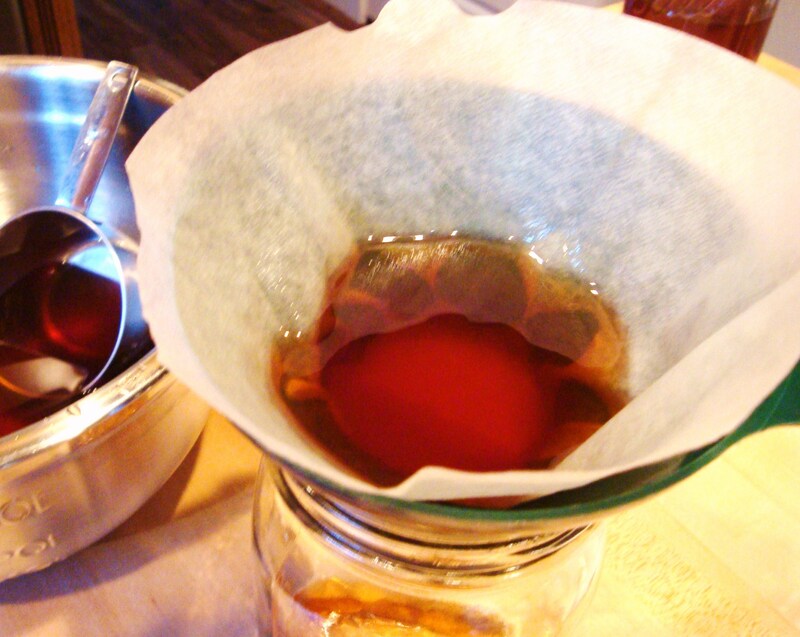 Dampen a paper coffee filter slightly (I use the cone #4 filters), and place it in a strainer or funnel. I prefer to use the wide-mouth funnel for this stage. Step 6 – Bottle and Consume! At this point, you can either return the liquid to your canning jar, or another large bottle. You also may opt to fill smaller bottles for gifts. Always be sure to sterilize your bottles and utensils! The filtration and straining process can take a very long time with some liqueurs. You may want to do it in stages. Be sure to give yourself plenty of time. For those occasions when I don’t have enough time, I wrap the liquid/jelly bag/coffee filter, etc. in plastic wrap (whatever is in process at the time) and go. It can usually be attended to later. Some liqueurs like the ginger-lime gin strain very quickly. But others like raspberry vodka or peach bourbon can take much longer. Categories: Tools and Techniques | Tags: filtering, straining | Permalink. Love your blog name, my husbad would appreciatte your creations! thank you! perhaps you could test out an infusion for a gift to your husband. I made my husband a trio of infused bourbons last year for his birthday and keeping them hidden in the closet was a bit tricky. But the end result is worth it! It sounds interesting, we have a one bedroom apartment it is going to be a challenge, but maybe we can do smth together and have it for entertaining guests! The pimento liqueur I’d homemade contained a lot of finely ground spices, and so coffee paper filters couldn’t even remove the smallest bits when the liquid was at room temperature. I found that chilling the liquid before filtering changed things drastically! I’m definitely going to get that jelly strainer. An inexpensive alternate is unbleached paper towels. They have a faster flow than a coffee filter and wont clog up as fast. Also they are a bit cheaper in many places that using cheese cloth. Good advice. I have used them from time to time, and find that they do a good job of removing some of the fine particulates that even escape the coffee filters, like small bits of spices, etc. Where do you get your bottles? Hi Paul, welcome to Boozed + Infused! The bottles in this photo are from Specialty Bottle. They have a huge selection, great prices, and they will sell any quantity. I use them to order cases of bottles, but use some local stores for smaller quantities, rush purchases, or different shapes and varieties. My local Home Brew store (Homebrew Exchange) has some fun ones, and a local Canning Supply store (Mirador) carries a lot. You can also try the container store or Michaels. The ones I typically use are the 5 oz woozy bottles, clear sauce bottle. I was just wondering…how do you go about sanitizing your glass jars/bottles? I’ve heard steaming, boiling, microwaving and even baking bottles will sanitize the glass, but am unsure of what method to use and for how long. I like making liqueur from passion fruits that grow on my land. After filtering out the seeds the remaining liquid has lots of thick slimy material. I have tried every filtering method but this stuff immediately clogs everything. So I have to let this material settle out and decant out the clear liquid. This takes many runs and many months. Is there any other process that you can suggest? Has anyone tried cream separators or centrifuges? I have not tried cream separation or centrifuges. But I usually find that paper coffee filters (often doubled for the toughest cases) do the trick. Did you try that process? What do you usually use for filtration? I have tried various stainless and plastic fine mesh, paper towels, coffee filters. All get plugged almost immediately. I end up putting it in very tall skinny bottles and waiting for it to settle and siphon out the liquid on top. The thick stuff at the end I use as topping on ice cream or add some to liquid I use for sorbet. From what I have read big places that make concentrated liquid use huge centrifuges. Way too expensive. I just wish I could cut a few months off the process.